As the days grow a bit shorter and the nights a little cooler, we can sense the approach of autumn and the changes it brings. Fall is root season! Autumn is a time of harvest and abundance, and as the earth itself grows cooler, digging for nourishing, medicinal roots gives us a close intimacy with the season and its generosity. Check out any wild-crafting article and there will be a long list of “don’ts” and with good reason. We need to be mindful of what plants we harvest, when, where, and how much. Many of our medicinally significant native plants have become rare, threatened, or endangered from over harvesting the whole plant, indiscriminately. The most well-known is American ginseng (Panax quinquifolia). Please familiarize yourself with the United Plant Savers rare and threatened medicinal plant list. While harvesting leaves may not be so harmful, harvesting roots and flowers threatens a plant’s potential for regeneration and establishment, which in turn shapes how our ecosystems function and thrive into the future. Yet, roots make up a significant portion of our more potent plant medicinals. Roots carry the life force of the plant. Medicinally, it works the same way for us. So, how can we harvest roots with a good conscience? 1. Cultivate highly valued plant species rather than take them from their habitats. 2. Wild harvest prolific plant species in your region. That is, the plants that are considered “weeds” because of their abundance and vigorous growth habits. Let’s do solution #2: “wild harvest prolific plant species.” Our common roots have well-established uses. It’s worth getting to know a few, intimately. So, yeah! Let’s dig these medicinal roots; dandelion, burdock and yellow dock! Dandelion is in everyone’s yard, sidewalk crack and garden. Poisons have been invented to get rid of it. Pavement has been laid down over it to smother it. Tools have been designed to pull it. Yet, here it is, cheerfully showing off its yellow flowers at the first signs of spring – in your yard, garden or sidewalk crack – year after year. Its airborne seeds fly across the sky and settle down in a new location quietly and unnoticed. Plants tolerate almost any type of waste ground. Come fall, the plant dutifully sends down all of summer’s sunshine and rain into its roots, never-minding what the rest of the world thinks or has done to try to get rid of it. Dandelion root is bitter. However, the bitter, the better. Dandelion has antitumor, antimicrobial, antidiabetic, anti-inflammatory, hepatoprotective, and hypoglycemic properties (Hoffman, 2003, Noh, H-Y et al. 2013). Dandelion root is a powerful diuretic, stimulating kidney function as well as the movement of bile from the gallbladder and liver. Folklore and scientific evidence supports the use of dandelion as a diuretic with intriguing possibilities that it may help with controlling blood sugar and inflammatory processes (Castleman, 2001). Due to its diuretic properties, dandelion may help PMS (Castleman, 2001, Hoffman, 2003) and, most recently, andropause symptoms (Noh, H-Y, 2013). But, wait! Before you try to pull a dandelion root, know this. You can’t. They will most often break off. So, will any plant that has a deeply embedded single-stemmed tap root. Burdock and yellow dock also have tap roots. None of these roots can be pulled by hand without some considerable trouble. Instead, we must dig down and around the whole plant to get most of the root. Pick a place away from heavy traffic of any kind and avoid areas that may have been sprayed. You’ll only need a small shovel. Or, if you have a digging fork, that can also be used. I find the dandelions that are the easiest to dig are in my garden. The soil has been turned and there isn’t the matted grass of the lawn to fight through. Like dandelion, burdock originates from Eurasia and has more sparingly, unlike dandelion, established itself along roadsides and waste places over most of the northern U.S. and Canada (Gleason and Cronquist, 1963). Though less prevalent than dandelion it is still considered a “weed” but a rather valuable one. Burdock is known as a powerful alterative supporting liver health. It has been used for all types of skin diseases, including eczema, especially, when taken together with yellow dock and sarsaparilla (Grieve, 1996). Burdock root is bitter. Very bitter. Because of this quality, burdock is used as a “bitter” which can help with digestion and appetite. Science is beginning to support its traditionally known role as a “blood purifier”, as evidence now supports its ability to rid the liver of environmental and chemical toxins (Herb Clip News, 2013). If you think dandelion roots are difficult to dig, then don’t bother trying to dig out burdock. Burdock roots grow with fervor – down. Roots are at least 12 inches or more in length and about 1 inch thick. Though, roots can, more often, be 2 to 3 feet deep. One time, not long ago, an herbalist acquaintance, a tallish man of over 6 feet, showed us his prize picture of the burdock root that he dug. There he was standing in the field, with his arm out stretched over his head grasping the root’s upper mid-section, as the rest of it towered over his head. The bottom of the root trailed for a few feet past his foot! This root was over 9 feet long! It was also quite thick at its mid-section. Maybe it was at least 6 inches in diameter. It was GIGANTIC. Imagine the crater that was left after that dig! Preferably first year roots are dug – first year burdock will not have a seed stalk. Grieve (1996) suggests that they should be dug in July. Waiting until after the first frost will make the roots starchier and sweeter. But, isn’t bitter better? Go ahead and dig it! This native of Europe is found along roadsides, fields, and waste ground throughout U.S. and southern Canada (Gleason and Cronquist, 1996). We have quite of few dock species, many of them preferring wet soil. Yellow dock is more wide-ranging. Yellow dock has the “crisp” leaves with curly edges. In fall their tall greenish inconspicuous flower stalks turn a reddish brown and so flag our attention. First year plants don’t make flower stalks. If in doubt, dig it. (Sorry.) But, a little bit of a dig will reveal its yellow-orange roots which is confirming. At times, I have been a bit confused but the yellow-orange roots are a give-away. Yellow dock roots are at least 8 to 12 inches long much like dandelion roots and about ½ inch thick. The roots are quite bitter. Traditionally, yellow dock has been used as a laxative, alterative, and a mild liver tonic (Grieve, 1996; Hoffman, 2003). Current research supports yellow dock’s use along with dandelion and burdock for IBS (irritable bowel syndrome) (Bone, 2011) and, interestingly, for bone health (Khalsa, 2003). One of my earlier experiences with yellow dock was as a midwife. We used yellow dock for iron deficiency anemia. Perhaps because it is a vegetable source for iron, it is better digested and tolerated by most women. I found a woman’s iron level improved with yellow dock tincture (about 1 teaspoon per day), as well if not better than women who took conventional iron supplements for the same amount of time. Despite its gentle laxative effect, yellow dock has not been found to stimulate the pregnant uterus (Romm, 2010). Considered safe to take in pregnancy, traditional midwives have made syrups combining dandelion and yellow dock roots with black strap molasses for added iron (Romm, 2010). To this day, I prefer that a woman take a teaspoon of yellow dock tincture rather than Feosol (a commercial ferrous sulfate supplement). 1. First step: Wash and dry. Scrub off the dirt without soap. Wipe dry or air dry your roots but don’t leave them out for many days. They will shrivel, get rubbery, and lose their quality. 3. Third step: Dry roots or prepare your tincture with fresh roots. Drying roots: I prefer to cut up the long roots so I can use portions of the root later. Dry roots on a tray in your oven by turning on the oven briefly to 200F and then turning it off. Leave the oven door open to allow for air to circulate. It is much easier to cut or grate fresh root, by the way, than waiting until after they are dry. Take the time to cut or grate them up. For making a tincture; fill a glass quart jar ¾ of the way with fresh roots or half way with dried roots (these roots are also available to purchase here). Cover with a good quality 80 proof vodka. Label your jar. Then, wait. Some check in to shake their jar every day, some only once in a while. No rules here, but more attention than less is more virtuous, I suppose. Happy digging it! You’ll come home, with not only a handful of medicinal roots, but a good story to tell along with them! 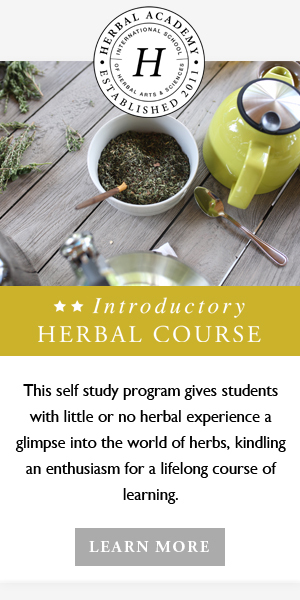 To learn more about herbs and how to use them, join us in our Online Intermediate Herbal Course. This post was written by Rachel Ross of Hillside Herbals. Rachel grew up between two nature sanctuaries and received a degree in biology and a Masters in Botany. Later, she acquired an RN, and MSN, and is now a practicing Certified Nurse-Midwife. She sees the plants as powerful allies to nourish, strengthen, calm, and heal. Her humble hope is to share this knowledge with you. Castleman, M. (2001). The new healing herbs. Bantom Books. New York. Gleason, H. and Cronquist, A. (1963). Manual of vascular plants of northeastern united states and adjacent Canada. D. Van Nostrand Co., New York. Grieve, M (1996). A modern herbal. Barnes and Nobles Books. New York. Hoffman, D. (2003). Medicinal herbalism. Healing Arts Press. Rochester, Vermont.